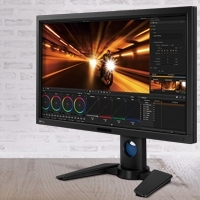 Whether at home or at the office, the BenQ Colorific™ TH670 delivers stunning quality video and presentations that will captivate your audience. Featuring Full HD 1080P resolution with a remarkable 3000 ANSI lumens and an outstanding 10000:1 contrast ratio; the TH670 beams a sharp, crisp image with fantastic shadow details and rich, accurate color even when the lights are on. Equipped with an extensive list of advanced features, the TH670 will satisfy even the most demanding application. Experience Full-HD content in sharp, 1080P definition and enjoy Blu-ray, video games and HD broadcasting in beautiful, high-contrast quality without downscaling or compression. With the BenQ TH670 you can watch Full HD1080p movies, TV shows and sports or play action packed video games on screens up to 200” diagonal in any room in the house. Your family and friends will be amazed by the magnificent picture quality, never has entertainment looked this good. The TH670 features powerful, superb sounding, acoustically balanced 10-Watt audio. Delivering ample, crisp, clear sound to fill even the largest rooms, allowing your message to be clearly heard. The USB port on the TH670 supplies power for accessories such as wireless dongles, providing the flexibility needed for today’s digital environments. For those occasions when the projector needs to be set at an angle from the screen, the TH670 automatically corrects the vertical trapezoidal effect on the image to deliver a perfectly squared picture each and every time. BenQ’s SmartEco™ Technology helps lower total cost of ownership (TCO), optimizing projector performance through dynamic power savings. Providing uncompromised brightness, exquisite picture quality and incredibly long lamp life. These innovations allow savings of up to 70% of lamp power consumption with the added benefit of lower maintenance costs. 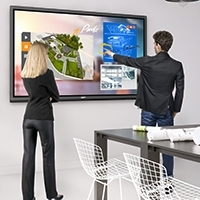 Projectors with BenQ SmartEco™ Technology provide lasting ultra-vivid viewing experiences. SmartEco mode is designed to use only the exact amount of lamp power a projector needs to deliver the best contrast and brightness performance. This feature enables the TH670 to deliver uncompromised projection quality with the added benefit of reduced the total cost of ownership by greatly extending lamp life and lowering power consumption. SmartEco Mode cleverly adjusts lamp power to maximize power saving, delivering the best contrast and brightness performance possible, using only as much light as needed. BenQ projectors feature DLP Link™-supported 3D projection to deliver the same amazing 3D performance and effects seen in 3D movies. The TH670 supports all mandated 3D format specifications. 3D Field-sequential, 3D frame packing, 3D top-and-bottom and 3D side-by-side. Equipped with built-in closed-captioning capability, the BenQ TH670 can display subtitles embedded in video content. No additional external decoder required. Automatic power off after the projector is turned on for over 20 minutes without a display source, eliminating unnecessary energy waste and prolonging the life of the projector lamp. When inactive, the TH670 keeps power consumption to a minimum with <0.5W standby power, achieving what was once a challenge for earlier projector models. This technological advancement in energy saving helps lower energy costs. BenQ Home projectors feature an intuitive, easy to follow user interface, allowing quick access to all projector features to enable users to customize their experience. The advanced Auto Source Detection in the TH670 detects input sources twice as fast as previous models. And even highlights the available active sources, making source selection faster and easier than ever. An easy to follow step-by-step guide will walk you through the initial projector setup. Whether you are a first time or experienced user, you will be enjoying stunning viewing experiences on your new BenQ TH670 in no time. Digital Light Processing (DLP) technology, recognized by the Academy of Motion Picture Arts and Sciences and awarded an Oscar®statuette in 2015. DLP is the leading projection technology used in 90% of world’s digital cinemas and 100% of IMAX theaters. 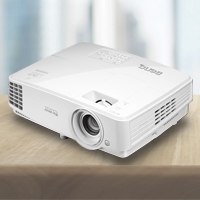 With over 50% share worldwide, DLP projector technology dominates the projector market. 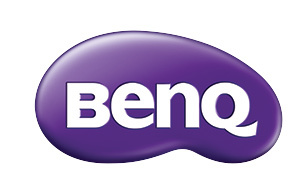 BenQ is the #1 best-selling DLP projector brand worldwide, delivering unmatched value and performance. Critically acclaimed for industry-leading high contrast, BenQ DLP Projectors also produce some of the sharpest, crispest character rendition, delivering crystal-clear image details and legible text by maximizing the fill ratio of individual pixels and employing BenQ’s exclusive SmartEco™ Technology.